When we were planning our 2017 “Ramble” dates, we purposefully wanted to be in the Roaring Fork valley for the 4th of July. 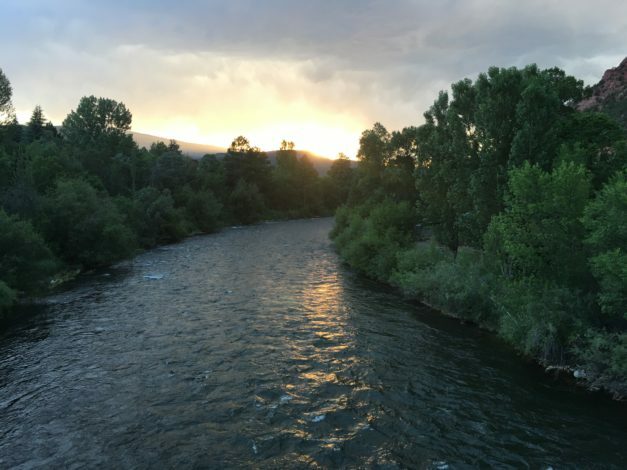 We’d heard of incredible fishing in both the Roaring Fork and Frying Pan rivers, as well as incredible fireworks in towns all along the valley. We arrived in the valley on July 3rd and setup the SaraLinda at the Gateway RV Park in Carbondale (CO). The RV park is set right on the Roaring Fork and the Rio Grande “hike and bike” trail that connects Glenwood Springs with Aspen. We learned that there was a “fire ban” in effect for the area and all fireworks displays were cancelled except for Glenwood Springs. 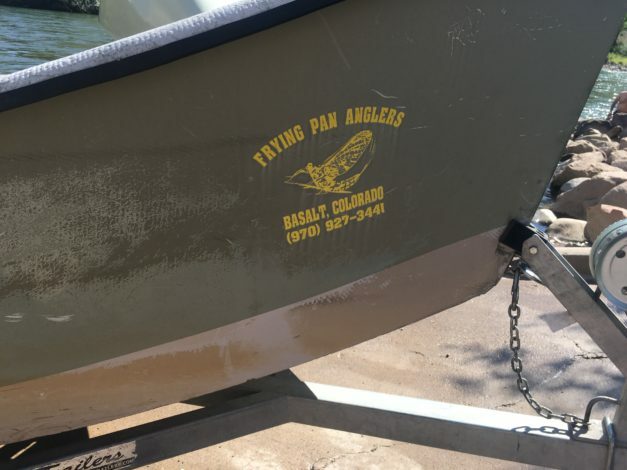 About a month before arriving in the valley, we’d contacted Frying Pan Anglers (FPA), a fly shop in Basalt (CO), and asked about booking a guide trip on the Roaring Fork for July 4th. I’d asked, “do you have guides who go out on the 4th”, to which the shop guy said “the fish don’t care it’s the 4th of July”. DUH! We laughed and booked the trip. 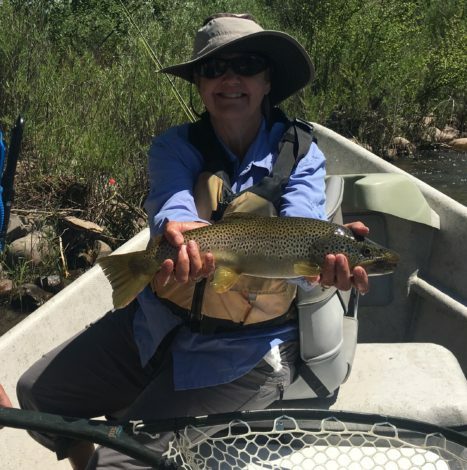 At 8am on the 4th of July, we met our guide, Ed Deison, at the shop and headed off to fish the Roaring Fork. When we got to the boat ramp, it was clear this was going to be a VERY busy day on the river. There were already 3 drift boats in the water at the dock waiting to start their trip and another 4 rafts ready to enjoy a pleasure float down the river. In the parking lot, the boats and rafts just kept coming, lining up, awaiting their turn to put in. It was going to be a bit crowded on the river it seemed. Undaunted, Ed pushed us off and floated down a bit to rig up our rods, away from the craziness of the boat ramp at Carbondale. We met another FPA guide, Dillon, who turned out to be from Austin (TX) and had gone to Lake Travis HS and Texas A&M on a baseball scholarship. Small world! After we’d rigged up, we started down the river and began what would become an “epic” day of hooking and landing really big, beautiful brown and rainbow trout. We started by throwing dry flies toward the banks, bringing these hungry trout to the surface to hit our flies. When that slowed a bit, we went to nymphing for them and things heated up even more. 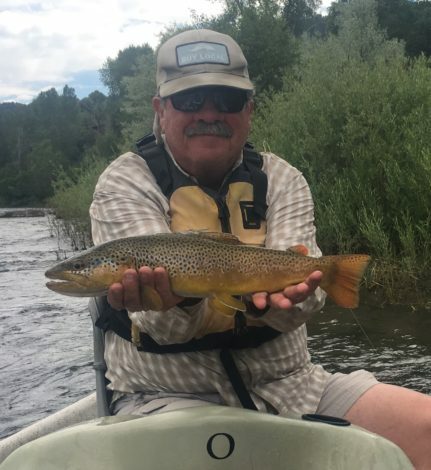 We always like to take at least one picture of a fish we’ve caught on a particular river, so when we caught a nice brownie early on, Ed wanted to make sure we got that one pic, so he pulled the boat over for the photo op. While we don’t count the number of fish we catch on days like this, it was a lot. When we’d catch an even bigger fish, Ed would pull over and get another pic for us. While we were landing what was our biggest fish of the day, Ed took a pic with his phone for the shop blog. When Dillon pulled up, his client had landed an even bigger brown trout. It was that kind of day. Lots and lots of big fish. When we finally arrived at our take out spot in Glenwood Springs, it was insanity. The boat ramp was so busy with everyone either taking out, or putting in, or getting ready for the fireworks that were happening that night at the park. 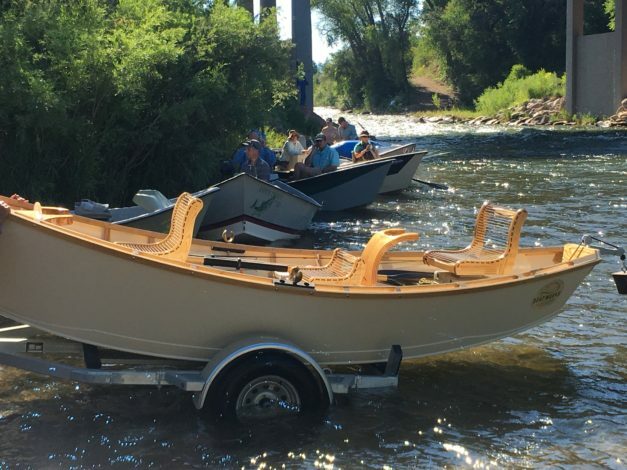 For us, our fireworks had already happened on an “epic” fishing day on the Roaring Fork.